Happy 4th of July to all Americans by birth or by choice, to all US residents, to all refugees and people with TPS living in America, and to all friends of the USA across the globe!!! It was quite an honor to meet President Barack Obama on his trip to Montreal on June 6th, 2017 where he delivered a true message of hope and unity. He reminded us that America is a nation of immigrants, that we need to embrace diversity and that women are key in the success of a country. The biggest determinant of how successful a country is, is reflected how they treat their women. The more woman are involve the better we are. » – Barack Obama. What a privilege to have finally met and talked to President Barack Obama, whom I have campaigned for, twice, as a proud Haitian-Canadian. It was an honor to have also been invited to President Obama’s table of honor. Quite an inspiring, historic and memorable evening for us all! This meeting meant a lot to me and to our team at the Fabienne Colas Foundation. It reinforced our belief that all is possible if we only give it a try and put on the hard work. It encouraged us to continue to leverage the power of the arts for positive social change and strong economic impact in Canada, the USA, Haiti (where we hold festivals) and abroad. I could not be happier to know that the 44th president of the United States and our Prime Minister of Canada Justin Trudeau also discussed that day their shared commitment to developing the next generation of leaders. 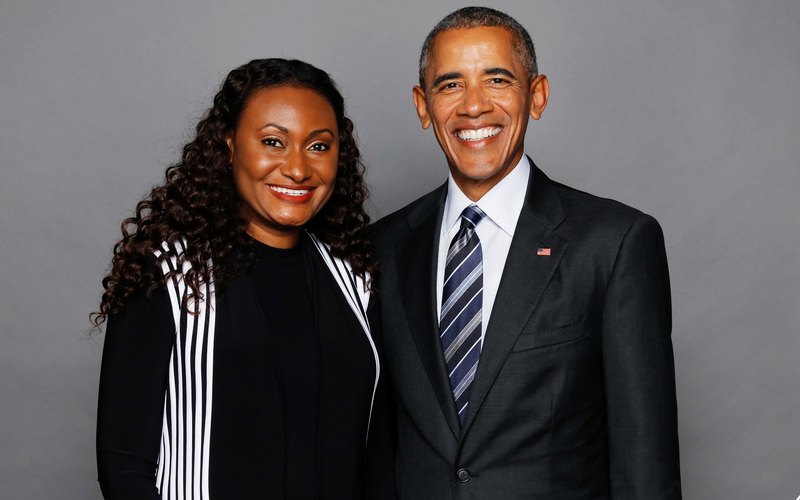 We are excited about the prospect of, one day, being able to share ideas, at some point, with the Obama Foundation about how we can get more young leaders to take decisive action in their communities. A big coup by the Chamber of Commerce of Metropolitan Montreal who made all this possible. A way to celebrate Montreal’s 375th anniversary! MERCI President Obama on behalf of our team at all our festivals – Montreal International Black Film Festival, Festival Haiti en Folie in Montreal and New York City, Toronto Black Film Festival, Halifax Black Film Festival, Fade to Black Festival and Festival du Film Québécois en Haïti. Rêve d’enfant: « Fabienne Colas, Femme de combat »!